Today in Duabai (United Arab Emirates) Several Saudi Women protested the Kingdom’s National rule which bans Women’s rights to drive — by driving. Apparently inspired by protests all over the world, these bold women decided it was time to resist the rule of Man. Good luck, Ladies. 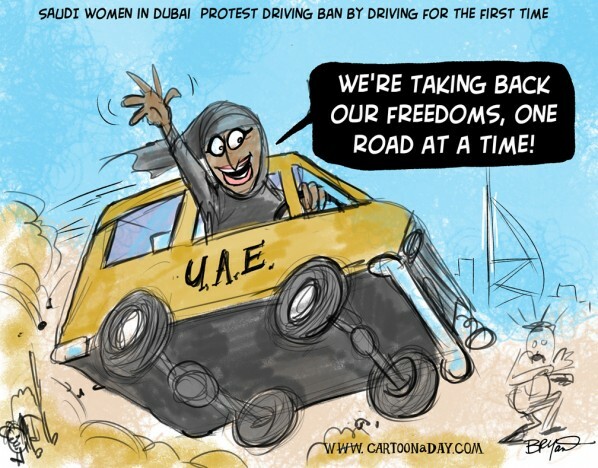 Inspiration: Cartoon a day featuring an Arab woman defying the rules of a driving ban. The cartoon Saudi woman is behind the wheel.